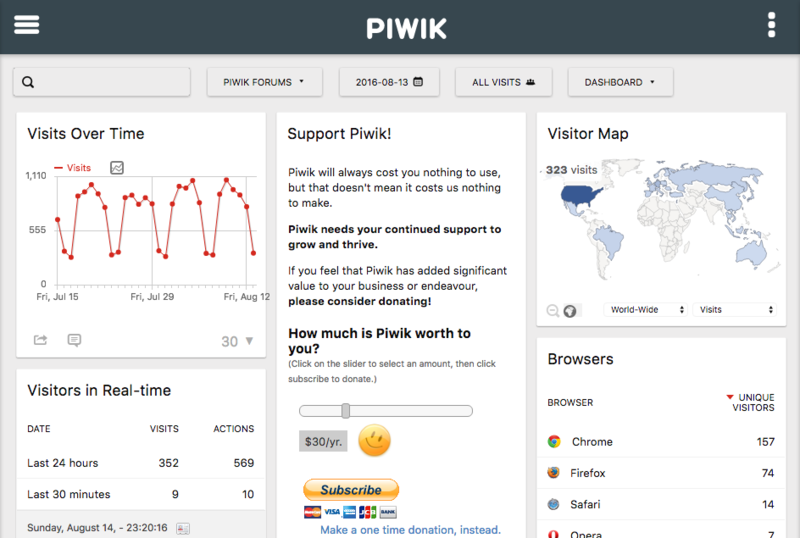 fixes #9919 Remove "Personal Plugin Settings" page and menu entry and move these settings to "Personal Settings"
fixes #10354 New widget "System check"
fixes #10353 New widget "System summary"
New UI based on material design as the current design of Piwik 2.X was a bit too flat. It will separate content cleaner and the UI is much more responsive. In the last weeks GitHub and WordPress have switched to use native fonts and we do so as well. 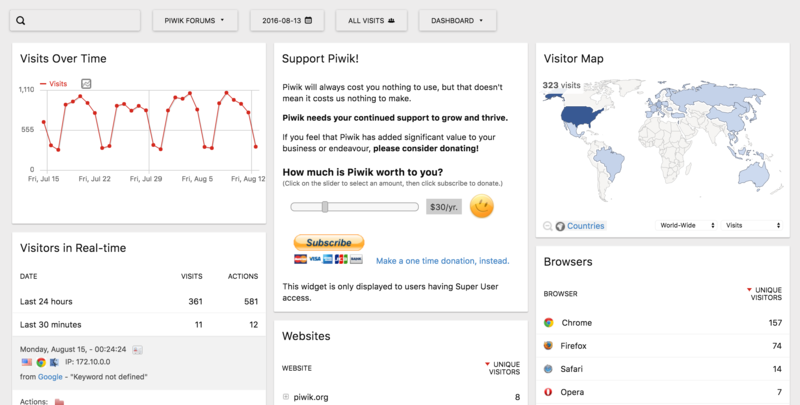 This means Piwik will look slightly different depending on the browser and operating system but in general it will look more "native" and more like your operating system does in general. Read more about WordPress' reasons to use native fonts. Plugins can change the colors, etc as usual. For example there is a new variable to change the top menu bar color and we might release some plugins with different top menu colors. ### The return of the "Zen mode"
By pressing the key "z" the zen mode will be activated and makes a very clean UI by removing several menus. We have enhanced the search a little so you basically do not need the menus on the top and left anymore. The only thing missing is to decide how to let users know that they can activate the zen mode. 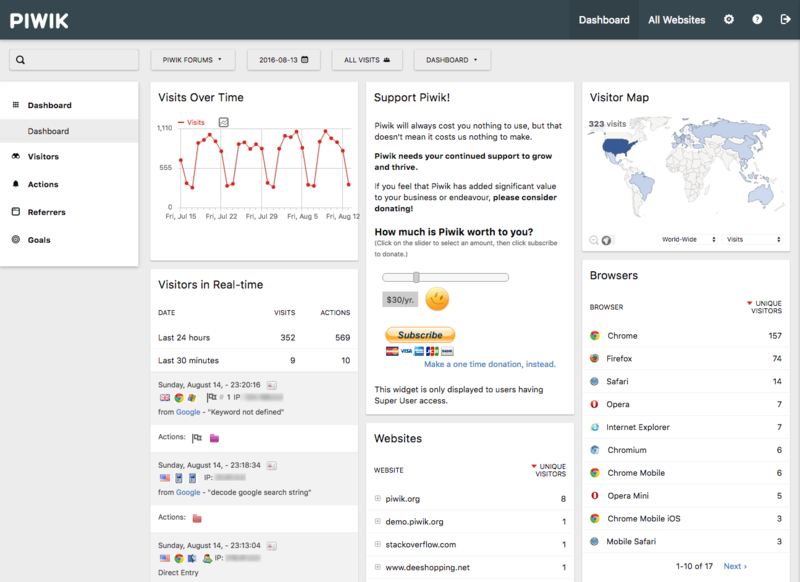 New Admin landing page. 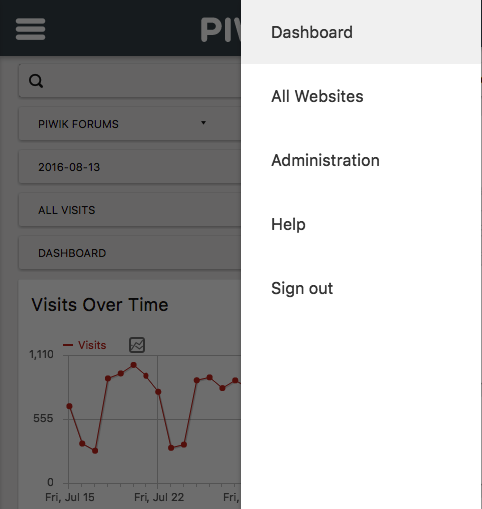 It has always been difficult for us to pick a good page to load when clicking on the administration link in the top menu and it even varied lots depending on the user access and the enabled plugins. We solved it by showing some useful information when going to the Administration page. The shown widgets depend on the user access, which plugins are enabled and whether other plugins disable some of the widgets. We have merged all "website" related settings into a new category in this menu so it is easier to find and we have splitted the "websites management" and the "websites global settings" into two different pages. 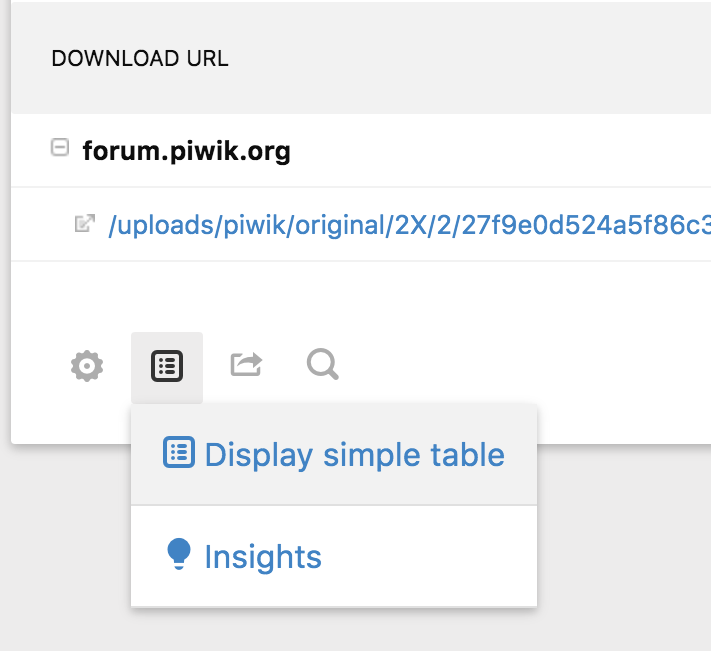 In Piwik 2.X when switching for example to the "all columns view" of a report it may have overlapped another report on the right. We have fixed this and now show scroll bars when it otherwise would overlap another report. 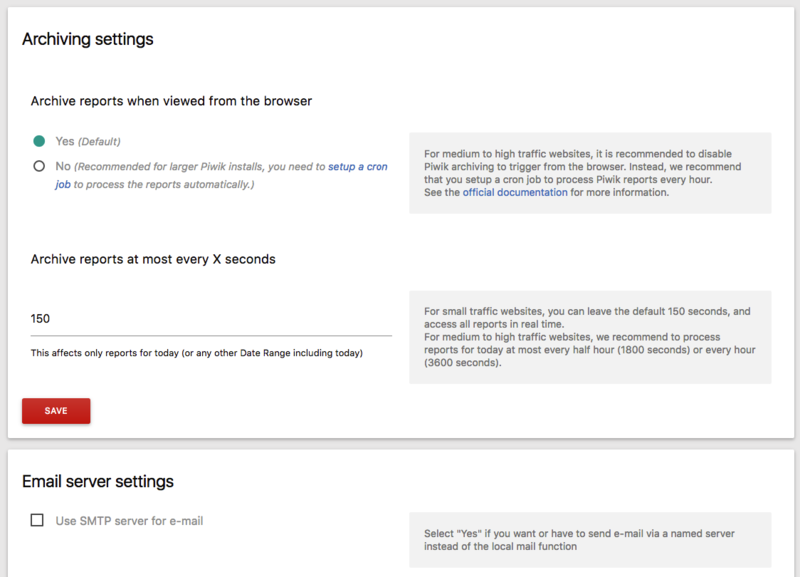 In the past we had a "User => Plugin Settings" page and an "Admin => Plugin Settings" page. 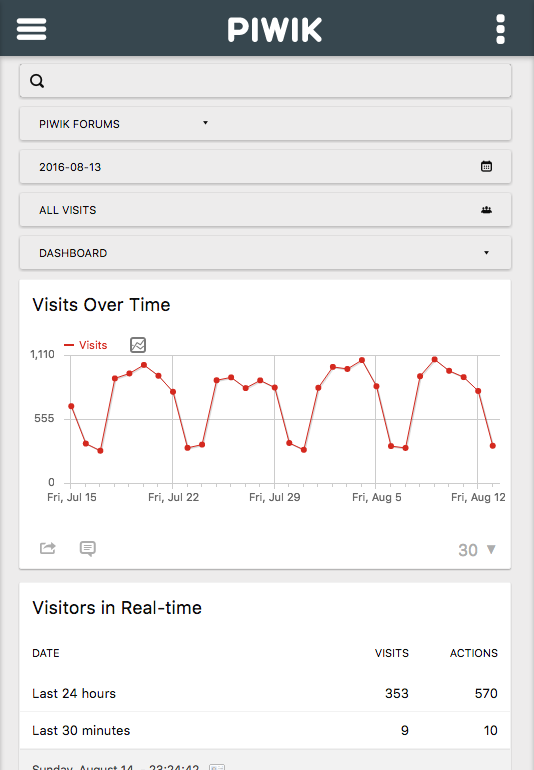 We have removed both pages and now show "User => Plugin Settings" pages under "Personal Settings" and "Admin => Plugin Settings" under "General Settings". 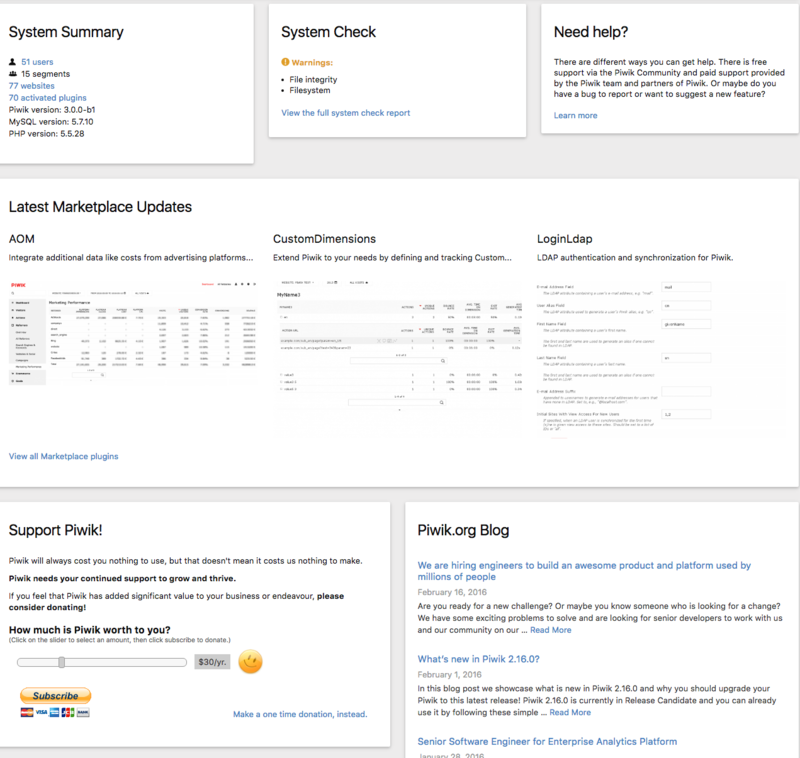 The plugin settings are now also more clearly separated from each other. 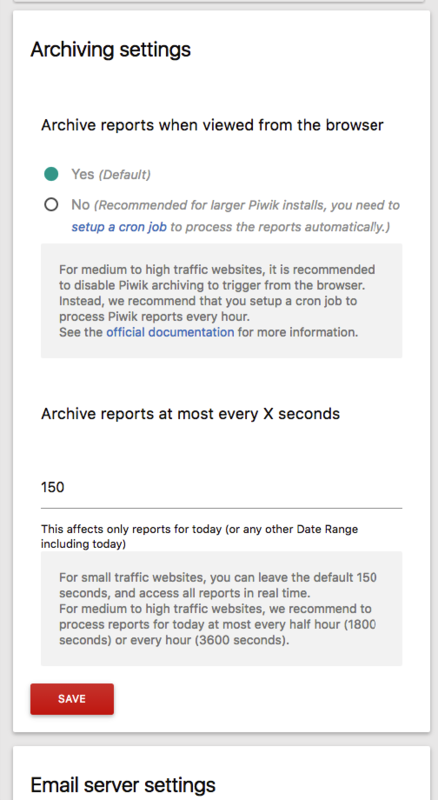 We do no longer reload the whole page when changing the date or segment. 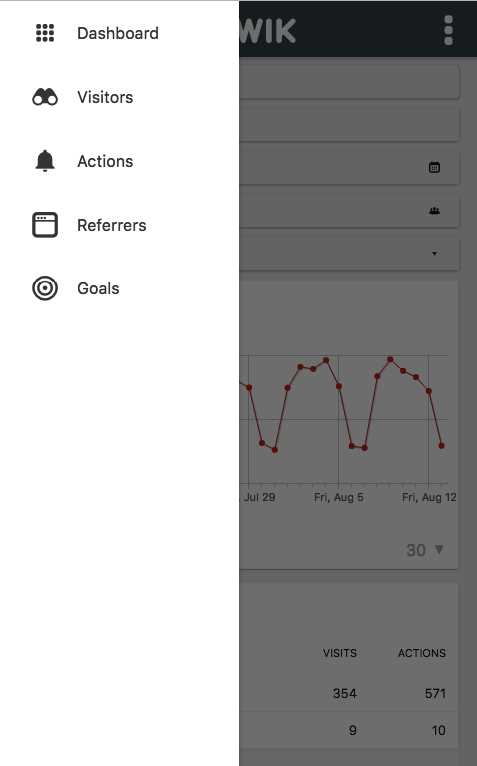 We have added new widgets that can be added to the dashboard. They are available to users with super user access and this way it is easier to see possible problems with the system etc. For our UI tests we have updated to PhantomJS 2.X as PhantomJS 1.X uses like a 9 years old rendering engine and wasn't able to render the UI anymore. The advantage is for example much more accurate and nicer looking screenshot tests. Making this work was quite a big challenge and we may still have to resolve some issues as some tests seem to fail randomly. I want to explain this one in a bit more detail. 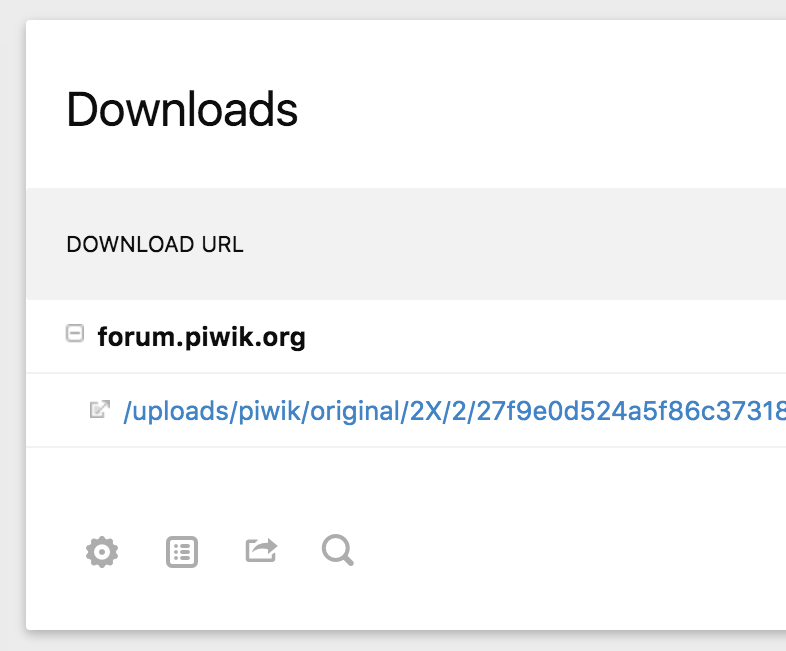 It was a lot of work to migrate all pages into the new "Look" of Piwik 3 because the markup for example for form fields was defined in each plugin again and again. In the future we will be able to globally change the markup much more easily by just changing eg one component for form fields and it will be applied to all of them. Also for "content blocks", headlines etc we have now components which should make it easier for us, and for anyone else to change the UI.